Guilin Hongcheng and Jiande New Calcium Industry have joint to set up the Lime Deep Processing Technology Development to help the innovative development of Lime Deep Processing. On December 23, 2018, in order to further explore and develop the development direction of lime industry and kiln deep processing, Mr. Rong Xinguo, the executive vice president of Guilin Hongcheng, led an elite team to conduct in-depth technical exchanges and discussions with Zhejiang Jiande New Calcium Industry Enterprise. The two enterprises jointly established Guilin Hongcheng Lime Deep Processing Technology Development Department, which contributed to the development of lime deep processing industry. Create a new chapter of grand development! It is understood that Jiande New Calcium Industry in Zhejiang Province is a professional enterprise in the development and production of calcium hydroxide deep processing equipment and product technology. It mainly produces calcium hydroxide, gray calcium powder and calcium oxide products. Its annual output is as high as 200,000 tons. It has more than 20 patents. 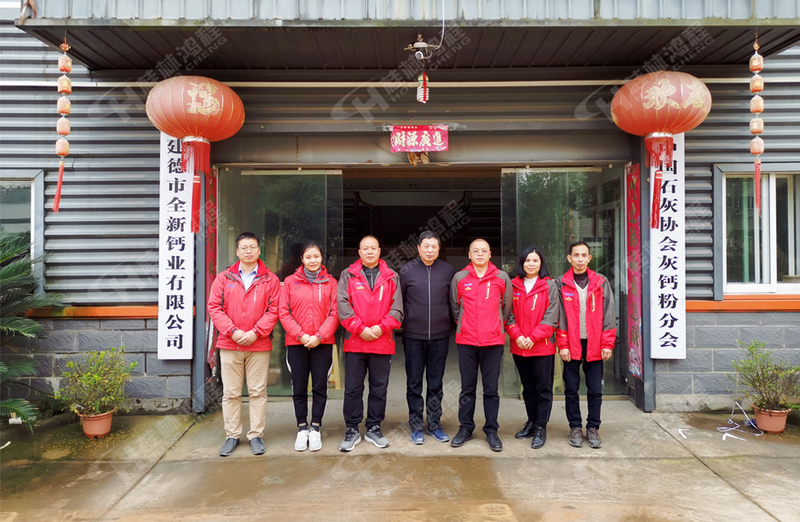 Among them, the production line of calcium hydroxide has been appraised by Hangzhou Environmental Protection Bureau as "the application and promotion project of environmental protection and energy saving products", so as the calcium product. Fu Zhiquan, the general manager of the industrial enterprises, has rich experience in the industry and is the drafter of the industry standard for ash and calcium powder. In order to jointly promote the development process of lime deep processing, Mr. Rong Xinguo, Guilin Hongcheng Executive Vice-President, and Mr. Fu Zhiquan, General Manager of New Calcium Enterprise, cooperate with each other. The two enterprises are strongly united to establish Guilin Hongcheng Lime Deep Processing Technology Development Department, which uses rich experience and advanced technology to share resources, innovate technology and jointly promote the lime deep processing industry. In the process of discussion, the two enterprises jointly visited the production site of the cooperative production line of annually output 200,000 tons of calcium hydroxide, deeply understood the market prospects of calcium powder, and jointly launched a heated discussion on the technical fields of lime deep processing and lime kiln furnace, thus contributing more to the development of the lime deep processing industry. Over the years, Guilin Hongcheng has been working intensively in limestone, calcium carbonate, industrial solid waste, environmental protection, metallurgy, chemical industry, building materials and many other fields. Through exploration and innovation, Hongcheng's series of grinding mills, calcium products deep processing production lines, wear-resistant products and services have made positive efforts and contributions to the development of powder industry. In recent years, in order to change the shortcomings of traditional calcium hydroxide equipment and further improve the quality of calcium hydroxide products, Guilin Hongcheng Environmental Protection Machinery Research and Development Team, after years of exploration and development, scientific and technological innovation and continuous improvement, has produced a new generation of intelligent deep processing equipment for calcium products, which has greatly improved production efficiency, changed the disadvantages of traditional production, strengthened product control capacity, and made new contributions for the deep processing development of lime. Guilin Hongcheng meticulously manufactured calcium hydroxide production line equipment has a number of patents, which changed the fate of the traditional calcium product industry at one stroke. It is a technological revolution in the history of scientific and technological innovation of calcium product deep processing production line. It is believed that in the future development, the team will continue to work hard and make progress with scientific and technological innovation, serving the development mission of society, based on market demand, customer-centered and innovative force to create brilliant achievements for the development of lime deep processing industry.